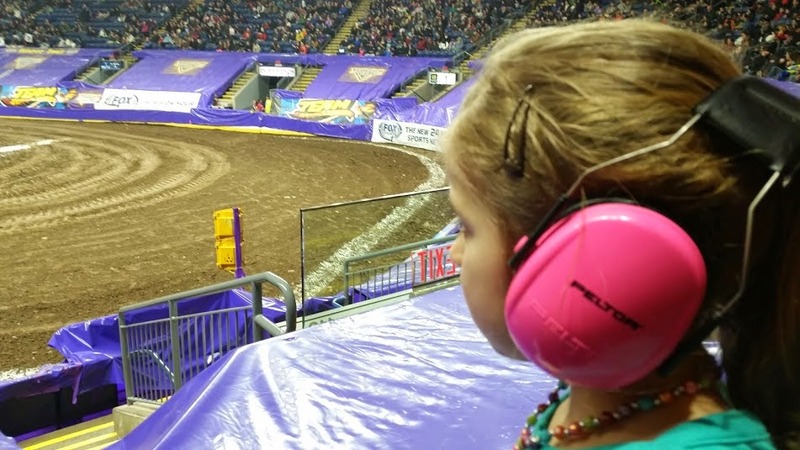 From Meredith to Mommy: Monster Jam is for Girls Too! 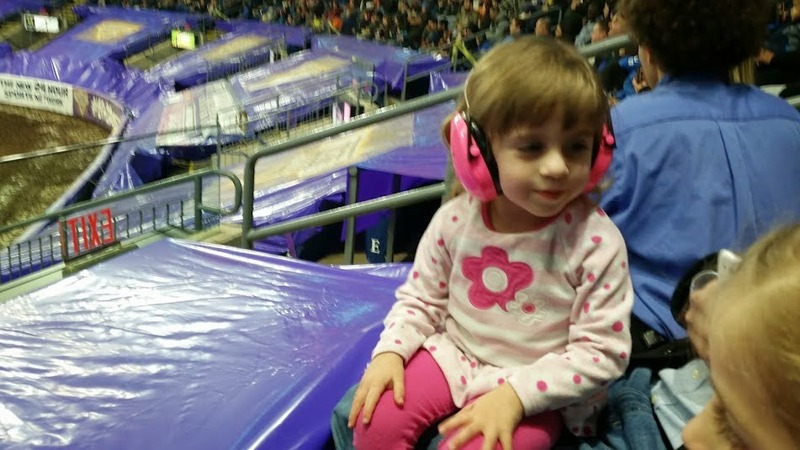 Monster Jam is for Girls Too! Last night, the girls went to Monster Jam. My girls. My little girls. My princess loving, dance obsessed, Barbie playing girls. Loud noises, big, jacked up trucks, lots of dirt...doesn't sound like something my girly girls would like. In fact, a lot of people looked at me like I was crazy when I told them where the girls would be spending their Friday night. 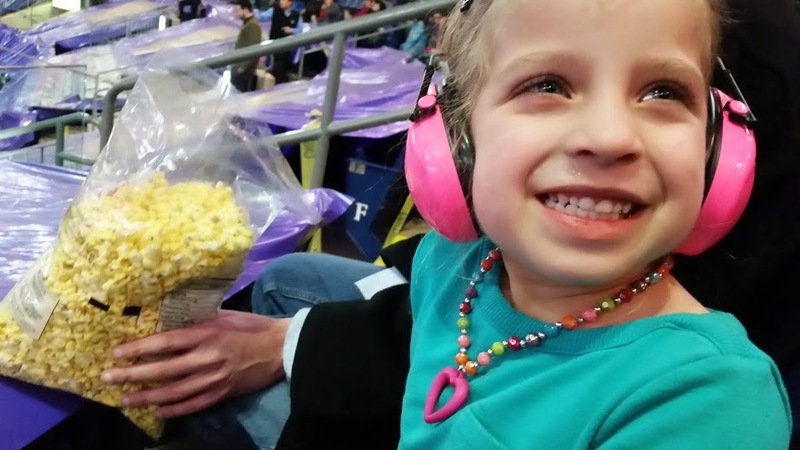 A couple of months ago, I had the opportunity to bring the girls to Disney on Ice. It was our first "arena" event and it was a perfect one. They are Disney loving kids. 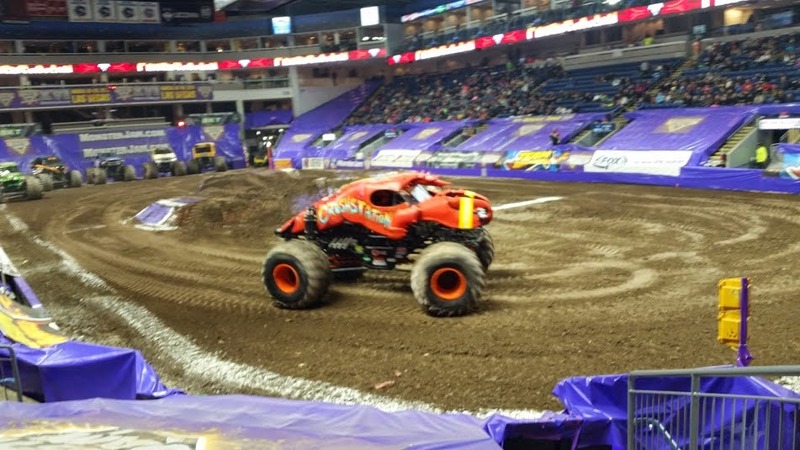 A couple of weeks ago, the same venue invited us back, but this time for Monster Jam. Truly up close and personal - right up against the tarp! Even I was skeptical. My girls are girly and monster trucks are loud. So we did what we usually do when we want to gauge their reaction to something before going all in. We went to YouTube and watched GraveDigger and his pals revving and flipping and donuting and kicking up mud. They were in. And they were crazy excited as the date crept closer and closer. So last night they went back to the Webster Bank Arena in Bridgeport, CT and spent the first few minutes in shock at how different a venue can look. 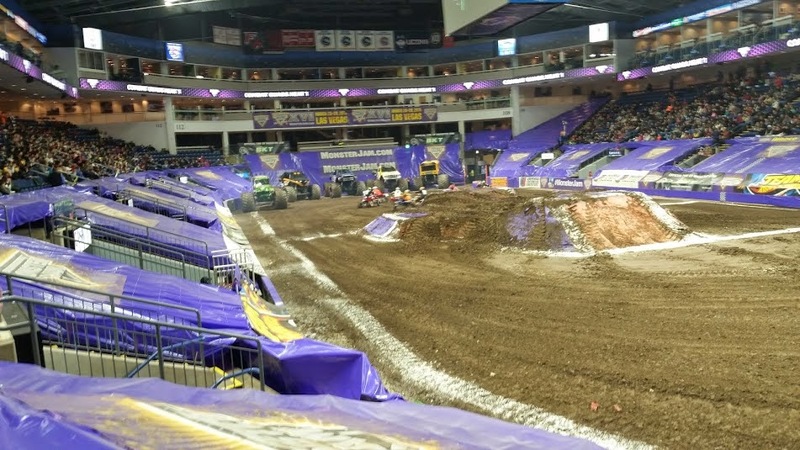 The smooth ice and fancy curtains from Disney on Ice were replaced with, literally, tons of dirt and a tarp keeping them a safe distance from some truly monstrous trucks. They were truly impressed. They loved the pun-ny names ("Crushtation" the Lobster Truck, anyone? 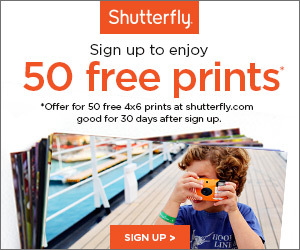 The HIGHER Education jacked up school bus?) 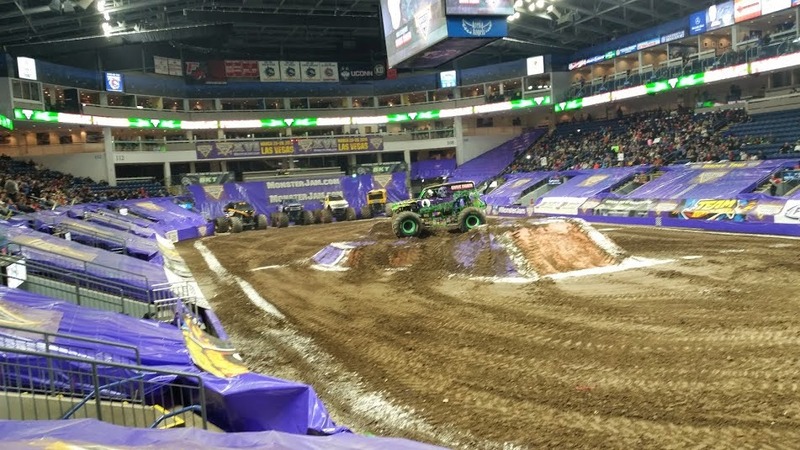 and cheered as loud as anyone when Grave Digger made his grand entrance - he was purple, after all. They were girly girls dressed in pink and decked out in jewelry, but they were as worthy of those seats as any little boy there. I can't tell you how happy I was that I checked my preconceived notion of what my girly girls would like and decided to go for it. They were CRACKING up that this truck was a lobster. And let's be honest, the big boys who accompanied them loved it too. In fact, I'm pretty sure the audience was full of lots of big kids still loving the allure of big wheels and big noise. The one thing that I am glad that I did as a precaution was to insist that they bring their noise canceling headphones. 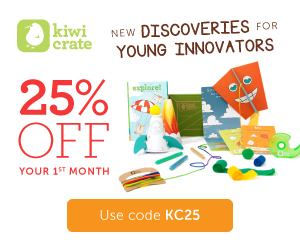 Ours are pink - of course - and extremely effective. The girls put them on as soon as they arrived at the arena and didn't take them off until they were back in the parking garage. Wearing these they were able to appreciate the noise without being overwhelmed by it. 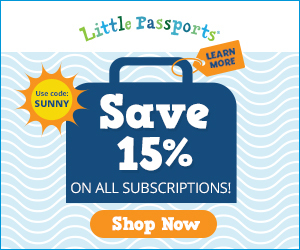 The arena does sell them, but we got a great deal on Amazon a couple of years ago and we were very glad we had them. Madison dressed herself to go. She chose a dress, leggings and a necklace and bracelet. The headphones complement them beautifully. Reagan picked her outfit too. She's actually not a pink loving kid, but she does love to color match. If you're in the CT area, Monster Jam is here for the weekend - tonight and tomorrow - and kid's tickets are as cheap as $10. Even if you have a girly girl, take a chance that they'll defy the stereotype and prove that little girls can wear their pink and love a good monster truck too!